Anyway, I thought I'd share my Teddy Bear Sweaters with my knitting buddies. This sweater is short so Teddy's tummy won't be squeezed. And the sleeves are a generous size for Teddy's pudgy arms. You can add stripes, or maybe a simple cable like I did. For a sweater to fit a 9 or 10 inch bear, click here. 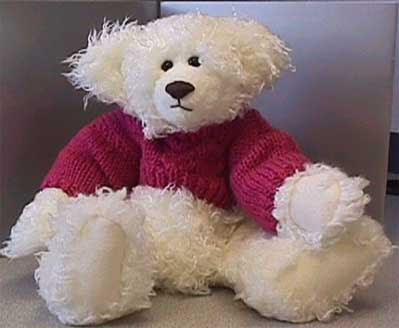 For a 12 inch bear sweater pattern , click here. For a 15 inch bear sweater pattern, click here. We're in our final week here. I am putting the push on to get more done of my final block in my Winter Wonderland project. So, I've threaded 10 needles. I'm stitching in the sun until they're done. Then I'll see where I am. Some time ago, I came across this sweet little pattern for a wristlet. It only takes a few scraps of fabric, and it's not hard to sew at all. Took me an hour. It features a little back pocket and a roomy main pocket. I bought it from Keyka Lou Patterns here. Because I'm signed up to get her newsletter, I received a 20% off any pattern code. I thought, I had to buy it. Now I know you are probably asking, "What will you put in your wristlet?" I had to think long and hard about that too. I could take a room key and a few cookies to the beach. Then I thought I could put some of my prized sharks teeth in it for safe keeping. Then I thought, I could put some hand quilting and stitching stuff in it for a cute carryall. Then, I realized that my two new Mini Ty Beanie Baby friends need a place to stay. And they are the perfect color too. Pink and purple. Do you think they look happy in their new little wristlet purse. I think so. A perfect fit! Another group display at the Myrtle Beach quilt show was called "Hitting the Bottle". Create an 18 x 24 inch quilt with hand dyed fabrics. The challenge is to maximize the dimension and texture using creative machine stitching on the bottles, jugs and jars on the piece. At the recent Myrtle Beach Quilt show, there was a nice workshop display. I thought it was so interesting and was such a interesting group project. All the pieces were beautiful and my pictures don't do them justice. Create a 12 x 36 quilt using black Kona cotton for the background and a piece of hand dyed fabric. Cut the hand dyed fabrics into horizontal strips with shapes and curves. Apply these strips onto the black fabric leaving approximately 1/4" between the pieces. Embellish. I was so excited this moring when Mert showed me what he picked up on our beach walk today. It's the biggest sharks tooth I've ever seen. Just have a look at how bit it is compared to the other sharks teeth that we've found in the past couple of weeks. Can you see the jagged edges? This little Martha bag is sweet and I like how one handle is looped through the other. She suggested it was good for a beginner sewer and experienced sewer. It looked like a simple bag but I just couldn't fathom how the sewing of those straps worked. Since I have some fabrics on hand, I thought I'd give it a try. The free pattern and instructions are here. I went to Staples to enlarge the pattern. It says to enlarge it by 200%, but I found that was a bit too big for my first bag. I used a 175% enlargement and the width of the bag is about 10" wide. There are 7 steps to making this bag. I completed steps 1 - 6 with no problem. Then in a few simple words, step 7 was a complete stumper. Steps 1 - 6 were no problem. Turning under 1/4 inch on both lining and main fabric, is harder than it looks. I thought I could sew it from the inside... Wrong!! In the end, I finished it. After I finished the bag, I went in to see if it was just me.. But I found the straps awkward and I would not say this was a beginner project. I should have read through all the comments before starting the project. I wasn't the only one who had difficulty. Some of the suggestions recommended using the Allpeoplequilt version here. It's a little different in that it has pockets inside and uses batting. But the most important part is that it has a totally different technique for putting it together. It looks easier.